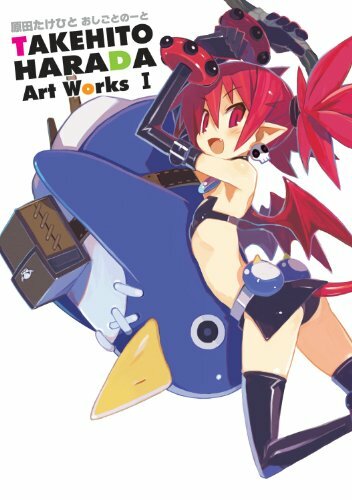 This 208-page artbook features Takehito Harada's artworks from Disgaea, Prinny 1 & 2, Makai Kingdom and Phantom Brave. Almost all the art you'll see are character art from those video game titles. If you're a fan of Disgaea or Takehito Harada, you may know or have the earlier artbook called DISGAEArt!!! Disgaea Official Illustration Collection, also translated and published by Udon. So yes, there are some duplicated Disgaea art in this book which has half of it dedicated to Disgaea. But there are some new Disgaea art too. The multitude of characters is amazing. The pages are filled with pretty huge splash art of Takehito Harada's Japanese style of characters with their candy-like colours. Many of the artworks have step-by-step images of the drawing process, from the sketches to colouring stage, showing how a complicated scene of characters are put together, slowly. The rather short commentary appear at the back of the book. It's a terrific artbook. If you already have the Disgaea artbook, it might still worth a buy. The book's a review copy from Udon Entertainment.